Routine vehicle maintenance will most likely keep you from being stranded on the side of the road. Though unexpected things do happen, such as flat tires, snapped fan belts and other unforeseeable incidents. If this happens to you, here are 8 steps on what to do if your car breaks down on the road. These days, too many drivers are distracted by GPS screens and texting. If a passing car swerves just a little at the wrong time and your disabled vehicle is too close to the roadway, it could be disastrous. A white “flag” signals to passing drivers that your vehicle is in distress and is not moving. It also attracts attention during daylight hours so drivers can give as much leeway as possible. Anything white will do, including a paper towel, gym t-shirt, or even a sheet of white paper from the glove box. Roll the window down a little, insert the white object and roll the window back up to secure it. Never, ever exit your vehicle on the same side as passing traffic, no matter how far off the road you are. Even if you have a passenger next to you, ask them to get out first so you can exit on their side, away from the roadway. If your disabled vehicle is rear-ended, any passengers inside could be injured. If the weather isn’t dangerous, your passengers should also exit the vehicle. Make sure they exit on the passenger side, away from traffic. Your passengers should stand several yards off the side of the road unless there are special circumstances. If you’re stranded on the side of the road at night, flares will help warn upcoming vehicles about your presence. Place the flares several yards behind your vehicle, on the berm. Locate them in a line so there are several flares in place before the spot where your vehicle is located. If you don’t have flares, bright cones will work, too. If your vehicle has a problem you cannot fix, call for emergency roadside assistance and let the experts take care of the situation. Provide details about your vehicle trouble, give them the exact location where you are stranded, and answer any other question so as to ensure they carry out things smoothly. More importantly, stay calm and follow instructions because your safety matters the most regardless of the incident. Sometimes it’s just a matter of waiting for your vehicle’s engine to cool down before you can get back on the road. If so, your wait time could be only an hour or two. But if you think your wait time could last into the night, use the daylight hours to prepare. Gather all your provisions, like flashlight, emergency food, tarps, blankets and first aid supplies, in one place. You don’t want to waste time or flashlight battery light searching for something that should have been right at hand. Never, ever try to flag down other drivers for help unless there’s a life threatening emergency. Doing so could startle other drivers and cause an accident. It could also needlessly endanger your life if the person you flag down has less than helpful intentions. 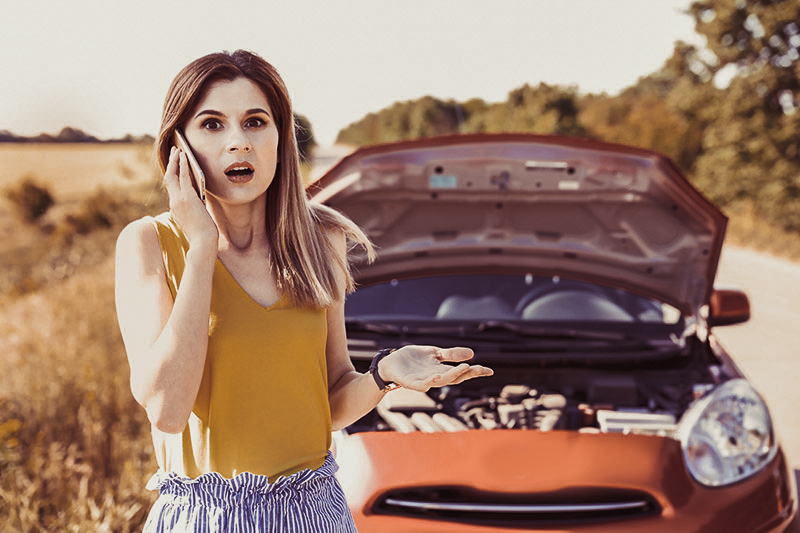 Even if all you need is a jump, it’s best to be patient and wait for the professional roadside assistance you personally requested, a law enforcement officer, or a friend that you contacted for support. These steps will keep you and your passengers as safe from harm as possible in a disabled vehicle situation. Have you ever been stranded on the side of the road? How did you solve the problem? Feel free to share your experience in the comments below.